The Smith Street site is situated in Scunthorpe, Lincolnshire. Historically, the site had been utilised as a commercial vehicle sales centre and repair garage. These activities featured fuel pumps with associated under and above ground storage tanks. At some point, there was believed to have been a release of fuel from one of the above ground storage tanks. The contamination encountered was attributed to the previously mentioned activities and included, Total Petroleum Hydrocarbons (TPH) and Polycyclic Aromatic Hydrocarbons (PAH). Envirotreat proposed a bioremediation and advanced stabilisation / solidification (using E-Clay Technology) as effective remediation strategies. The overall remediation strategy was designed to address the source and indirectly the pathway contamination issues in order to protect the identified groundwater and human health receptors. The remedial operation involved the ex-situ bioremediation treatment of the identified contaminants of concern to the agreed Site Specific Target Levels (SSTL), which are summarised in Table 1. The SSTL were derived based on a sitespecific risk assessment approach. The treatment of contaminated soil enabled compliance with the identified SSTL through the degradation of the identified target pollutants within the soils. The treatment operation was designed to fully recover the waste soils in order to produce a raw material suitable for reuse on site in accordance with predefined and agreed criteria. The remediation strategy involved two phases; a pre-treatment phase and the remediation works. 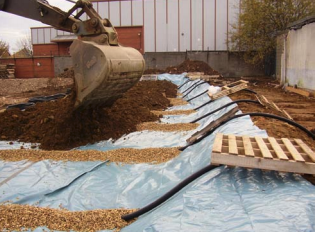 The pre-treatment stage involved the excavation and mechanical screening of the contaminated soils, which were then stockpiled prior to treatment. Due to site size constraints, all of the contaminated material required excavation to free up an area, which was then prepared as a base for the treatment operation. All soils awaiting treatment were stockpiled near the vicinity of the treatment zone and the underlying ground protected against run-off, and cross contamination by the use of an impermeable membrane and bund. The actual treatment stage involved the construction of a biopile where the contaminated materials were mixed with specific soil conditioners to promote bio performance.